Situated 4 kilometres from the city of Maó, Talatí de Dalt is one of the most important villages in the Menorcan prehistory. The talayot village preserves some spectacular monuments amongst which are the two natural caves, possibly used for burials in a pre talayotic culture era, the central talayot on the highest point of the village fulfilling the function of watchtower and control of the territory and the sanctuary with a singular "taula", built possibly in the V century B.C. 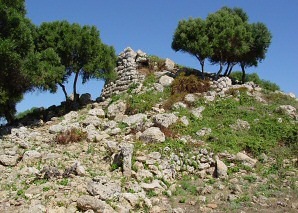 Talatí de Dalt also preserves two more talayots situated in the perimeter of the old village, several talayot houses and a part of the wall that surrounded the area. It appears that a community of shepherds and farmers settled in Talatí de Dalt in the second half of the third millennium B.C., but the village was built from the end of the second millennium before Christ till 123 B.C., the time when the Romans conquered Menorca. As from then, the village entered into decline, although it continued to be inhabited until the expulsion of the Moors in the XIII century. The moment of maximum activity of the village is between the IV and II centuries B.C., the era when the Phoenician merchants distributed all kinds of products amongst the talayot communities of the Balearics. Since 1997, archaeological excavations have been carried out in Talatí de Dalt, first by the Amics del Museu de Menorca and at present by Arqueomenorca, the firm that administers the remains via an agreement with the owner of the land where they are situated. This Menorcan firm also administers the walled village Son Catlar, in the municipality of Ciutadella. The visiting times for Talatí de Dalt is from 9.30 a.m. to 9 p.m. and the tickets cost 3 euros for adults and 2 euros for children. More information about Talatí de Dalt on: www.menorcaweb.net/talati.